Positively Unequaled. 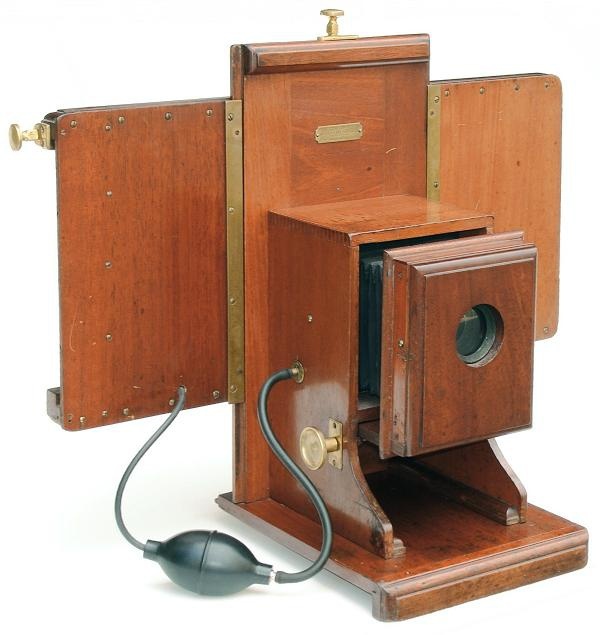 After 1900, a myriad of multiplying cameras were available to photographers; specialized apparatus able to cost effectively produce two or more images on a single photographic plate. Designs varied. Some of the cameras had shifting backs (Gennert Penny Picture Camera) or lens panels (Wing Ajax Camera) using cryptic registration systems that are undecipherable without an instruction manual. In 1901, a simple to use multiplying camera was patented. Although it never gained popularity and is rarely found today, the Sunflower Multiplying Camera had a striking design and innovative features. The camera was sold by Jas. H. Smith & Company, a company that grew into the well known Smith-Victor Corporation, manufacturers of photographic lighting. The origin of the Sunflower Multiplying Camera is somewhat of a mystery. According to the Smith Victor website, the company was founded in the late 1800's, when James H. Smith, mustered out of the Union army after serving 3 years with the Army of the Potomac. After a brief apprenticeship to a photographer in Illinois, he bought a half interest in a photo studio and, within the year, the other half. Over the next 12-13 years, James H. prospered as a professional photographer. "He moved his family and his business to the growing town of Chicago, Illinois, and continued to market his own products as well as buying and marketing others' patents. His products became widely known and he became an industry leader, serving as Secretary of the Photographic Merchant's Association." An 1898 Catalogue of Photographic Sundries describes Jas. H. Smith & Company as manufacturers, importers, and trade agents located at 311 Wabash Avenue, Chicago, Illinois. "Diamond" and "Globe" cameras, probably Smith's private brands, well known Poco Cameras by the Rochester Camera Manufacturing Company, a large variety of lenses and accessories including Smith's negative racks and James Flash Lamps dominate the catalogue for the "intelligent buyer" who would want "the best for the least money." In 1901, fires in two successive years wiped out Smith's business and bankrupted him. Smith rebuilt the company by inventing a more powerful form of flash-powder and by 1909 was marketing Victor powder under the James H. Smith & Sons Corporation name. But from 1901 to sometime on or before 1909, Smith must have made one last attempt at marketing photographic apparatus. Was the Sunflower Multiplying Camera one of Smith's last attempts in marketing cameras before specializing in photographic lighting technology? Unfortunately, the origin of the camera still remains a mystery because Smith-Victor was not aware of the details regarding Jas. H. Smith's dealing in photographic apparatus when I contacted the company in 2004. The camera was invented by Jacob F. Standiford (Fort Scott, Kansas) and granted United States Patent No. 668,888 for a Multiplying Photographic Camera on February 26, 1901. A brass maker's label located on the body includes the camera name, patent date, and it being "made by Jas. H. Smith & Company, Chicago." The actual years of production are not known, but a 1903 advertisement proclaimed the camera as "Positively Unequalled" and built for making 6, 8, 12, 18, 24, or 36 small negatives on one 5 x 7 inch plate. The SunFlower multi-image system is actually very easy to use, especially compared to the Gennert (which I never figured out). Regulating the number of images on a plate is accomplished by a pair of knurled brass knobs, one located on top of the body and another on a back wing. Each knob has engraved numbers corresponding to the number of positions that the back will slide and lock along the plate format. The side knob regulates the number of positions along the plate length (horizontal) while the top knob regulates the vertical positioning. Cover of Jas. H. Smith Catalogue of Photographic Sundries. Dated Chicago. June 1, 1898. For example, a mask that came with the camera is sized for 6 images on a 5x7 plate in a 3 x 2 array: 3 across the 7" length and 2 across the 5" width. Corresponding numbers on the knobs have matching registration notches in the brass posts. In this case, the top knob is rotated to "2" iindicating two images on the vertical) and "3" on the horizontal knob. 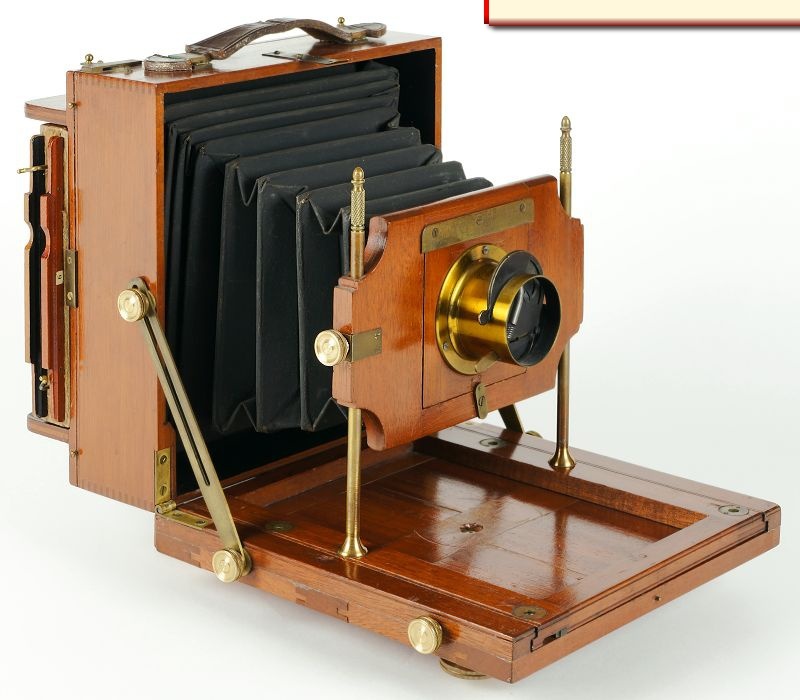 Interestingly, the camera shown on this website has registration markings for only 32 images in an 8 x 4 array as opposed to 36 images noted in the 1903 advertisement. In all, it's a very intuitive, easy to use system. Two other features make the Sunflower an innovative camera. The first is a shutter that is coupled to the sliding back. 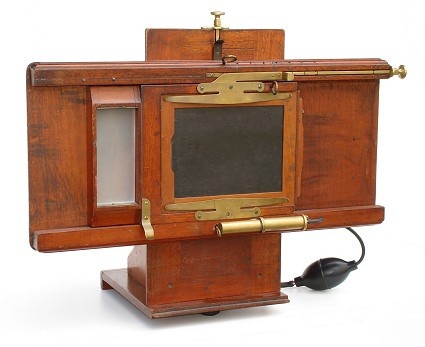 When positioning the ground glass for composing and focusing by sliding the back to the right, a large brass piston is depressed and the shutter opened. Shifting the back for making exposures plate closes the shutter. This feature also makes it easy for the photographer to quickly shoot multiple images because the shutter is closed and there is no need to repeatedly insert or remove the plateholder darkslide. pneumatic piston that is coupled to the shutter.